As the top network provider in the USA, AT&T had presented much 4G mobile broadband for wireless LTE network connection. They are very popular with the end-users. However, for those who are unfamiliar with the 4G LTE Wireless routers, they may have trouble to select the best LTE router for themselves. The AT&T Unite Explore and Nighthawk M1 are the two most popular LTE mobile hotspots. Someone may ask: what’s the difference between the AT&T Unite Explore and Nighthawk M1? Which one is better? We will review the features and specs of the two mobile hotspots. You may get the answer from this article. The AT&T Unite Explore comes from the manufacturer Netgear and the model number is Netgear Aircard 815s. 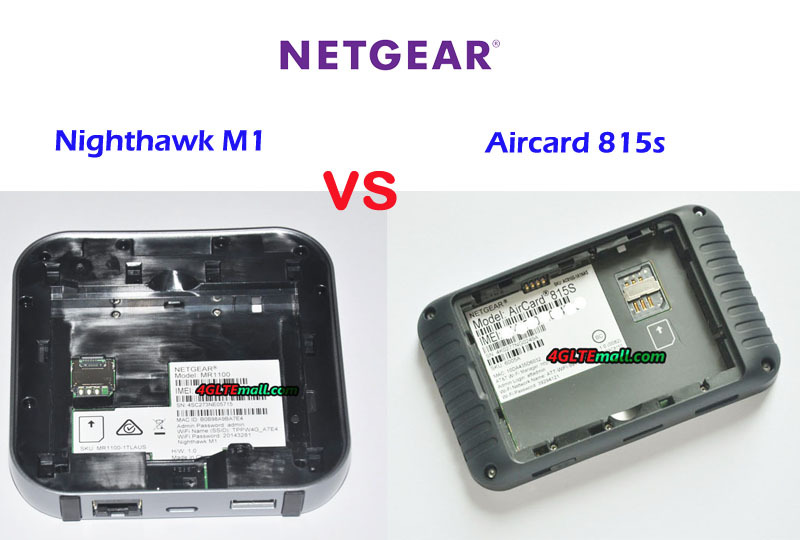 The AT&T Nighthawk M1 also comes from the Netgear. The Aircard 815s AT&T was available in the market much earlier than the latest AT&T Nighthawk M1. If you had read some promotion post from AT&T, you may know the Aircard 815s is the world’s first rugged mobile hotspot, which is waterproof and dust-proof. Like other Netgear WiFi hotspot AT&T, Netgear Aircard 815s has a touch screen on the front and two buttons (Home and Back) at the side of the screen. The Nighthawk M1 is different this time, it has a round screen, but not touch screen. The power status and signal status are indicated by the LED indicators around the screen. The AT&T Unite Explore logo is at the left side of the screen. Two connectors for external antennas are available at the edge side of the body. The Nighthawk M1 also has two connectors for external antennas, and they have the same connector type TS-9. 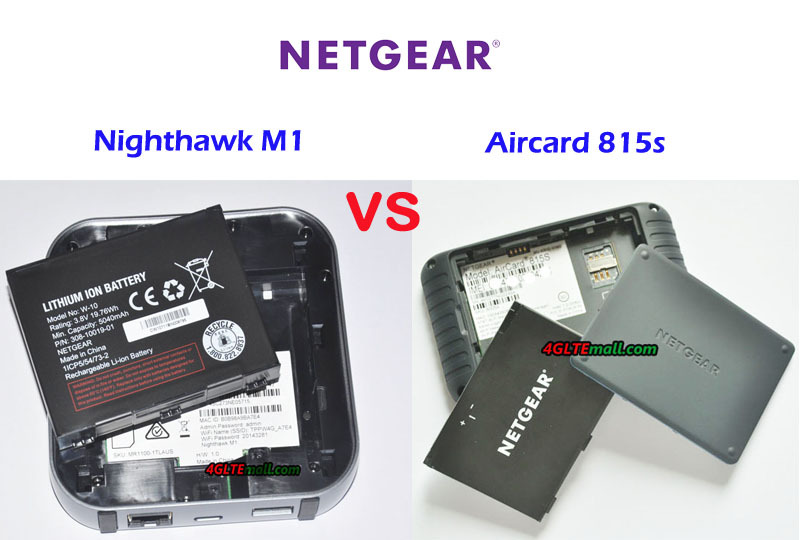 The battery of Aircard 815s and Nighthawk M1 could be removed for exchange and they both use Micro SIM card size. They both have a USB3.0 interface. The unique feature of Netgear M1 is that it also has on Ethernet port for LAN and USB type-A for output. This feature should be highlighted because there are very few 4G mobile router with Ethernet port in the market. From the appearance and interfaces, we can see the two AT&T 4G mobile hotspots are very different. The ATT Unite Explore special feature is the rugged design with a touchscreen. The Netgear Nighthawk M1 AT&T seems more powerful with Ethernet port and more interfaces. However, the Nighthawk M1 doesn’t configure a touchscreen. Let’s have a check the full specs of AT&T unite explore and Nighthawk M1. From the table, we can see the Nighthawk M1 AT&T is more advanced with the support of LTE Category 16, which could achieve download speed to 1Gigabit/s. The AT&T Aircard 815s is an LTE Cat.9 hotspot supporting download speed up to 450Mbps. 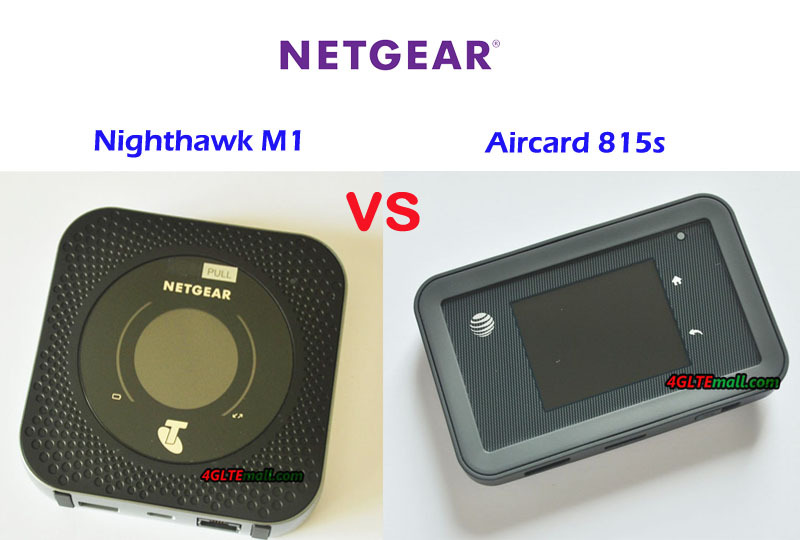 The AT&T Nighthawk supports more WiFi users up to 20 users while Aircard 815 supports 15 users. The Nighthawk M1 and AT&T Unite explore supports similar LTE frequency bands for ATT. However, the Nighthawk M1 has a variant model for Australian network provider Telstra, which works on difference LTE frequency bands. What’s more, the Nighthawk M1 supports more LTE advanced Pro network technology such as 4 x 4 MIMO and 4 band carrier aggregation, which make the high-speed downlink possible. Since both of the AT&T mobile hotspots has the JumpBoost feature, which makes the Netgear hotspot work like a power bank to charge other devices. 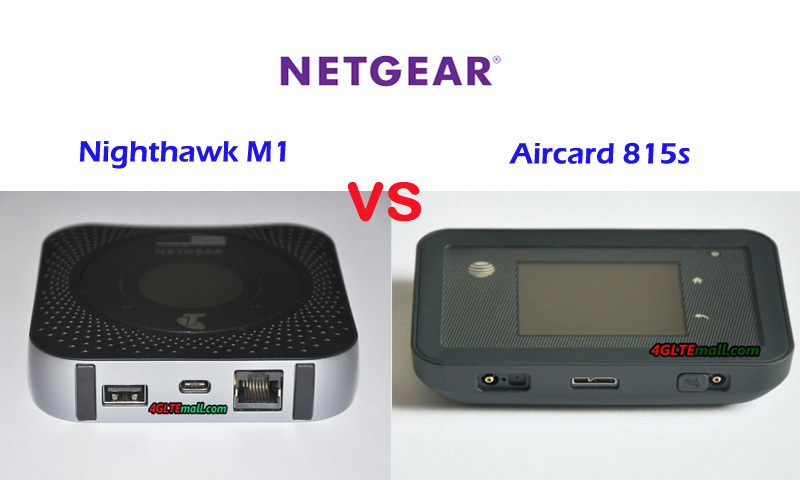 The Aircard 815 has a battery of 4340mAh capacity while the Nighthawk M1 has a battery of 5040mAh. So the AT&T Nighthawk M1 is more powerful than the AT&T Unite Explore in almost all the aspects, which means the Nighthawk M1 price would be much higher than the older model Aircard 815s. If you are a price-sensitive buyer, the Netgear Aircard 815s seems good enough, but if you want a future-proof pocket hotspot, the Nighthawk M1 is no doubt the best one. By the way, there are unlocked AT&T Unite Explore and Unlocked Nighthawk M1 AT&T available on http://www.4gltemall.com online store. You can buy unlocked ones for global use.